When preparing your turkey, remove the neck and giblets from inside the bird (I forgot to do this one time and left the bag of giblets in the turkey, no harm done, but I didn't get to use the giblets for my gravy). See my tip below on what to do with the giblets and neck. Thoroughly rinse bird inside and out with cold water. 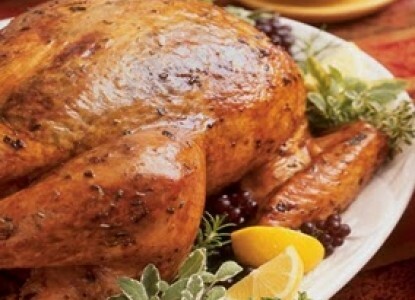 Loosely pack your turkey with stuffing if you're stuffing your bird. Click for our favorite stuffing recipe. If roasting the turkey open in a roaster, place the turkey on a rack, breast side up, in the roasting pan and bake at 325^ according to the time chart below, using a meat thermometer placed in the thigh muscle, until the turkey reaches an internal temperature of 180^. While the turkey is roasting, use a baster to bring the juices up and drizzle over the turkey while it's roasting. I do this after the 1st hour, and then about ever half hour or so, whenever I think of it and get a chance. While my turkey is cooking I boil the giblets and neck in a medium saucepan filled with water (enough water to cover all the giblets and neck) for about a half an hour or so until they're thoroughly cooked and have flavored the water. I set it aside and leave it alone until it's time to make my gravy. When it's time to make my gravy, remove the giblets and neck and add some of this water to the juices from the turkey and make my gravy with the juices from the turkey and the flavored water. It gives you more gravy, which sometimes is necessary in our household so we can slather it on not only our turkey, but also our garlic mashed potatoes and stuffing. And then I'll use it to make hot turkey sandwiches for leftovers (one of my personal favorites for leftover turkey). Also, if you'd like, you can chop up the giblets and add them to your gravy as well. My Mom used to make "giblet gravy" as she called it. I personally like it without the giblets. But our dog and cat sure love the giblets as a treat for the holiday!